Biography of Russian Baroque Architect. architecture of the late 18th century. Born in Paris, Bartolomeo Rastrelli was the son of the sculptor and architect Carlo Bartolomeo Rastrelli. Arriving in Russia at the age of 15, he received his first architectural commission in 1721, during the era of Petrine Art, when he was invited to design a palace for Prince Demetre Cantemir of Moldavia. From an early stage, Rastrelli's aim was to inject Romanov Baroque with the latest Italian motifs. All went well, and as his works pleased the Russian court, so he rose through the ranks becoming senior court architect in 1730: a position he retained under the Empresses Anna and Elizabeth (17301762). In addition those cited above, his main commissions included: Saint Andrew's Church, Kiev (1748-67), Vorontsov Palace, St. Petersburg (1749-57), Hermitage Pavilion, Tsarskoe Selo (1749), Mariyinsky Palace, Kiev (begun 1752), and Stroganov Palace St. Petersburg (1753-54). Other buildings include the Mitava Palace and the Annenhof Palace at Lefortovo. Rastrelli's popularity and influence gave him many followers, who formed a distinct school of architecture called "Russian Baroque". Among them were the Russian architects: S.I.Chevakinski (1713-83), A.F.Kokorinov (1726-72), Prince Dmitry Vasilyevich Ukhtomski (17191774), V.I.Bazhenov (1737-99), Matvey Fyodorovich Kazakov (1737-1813) and I.E.Starov (1743-1808), some of whom adopted the principles of neoclassical art and entered the service of Empress Catherine the Great. Their successor Empress Catherine II (Catherine the Great), however, considered Baroque architecture to be too old-fashioned. She replaced Rastrelli with the Scottish architect Charles Cameron (1745-1812), who went on to design a number of buildings in the more modern style of Neoclassical architecture, including the Pavlovsk Palace (1782-86) and the Alexander Palace (1812), near St Petersburg. Meanwhile, Rastrelli was retired to the Duchy of Courland, a coastal region of Latvia, where he was given the task of completing and decorating several palaces owned by the ducal court, such as Rundale Palace, Pilsrundale (completed 1767) and Jelgava Palace (completed 1772). Not long before he died, Rastrelli was elected a member of the Imperial Academy of Arts, St Petersburg. The Catherine Palace is a Rococo palace situated in the former town of Tsarskoye Selo, to the south-east of St. Petersburg, Russia. Designed around 1717, by the German architect Johann-Friedrich Braunstein, as a summer residence for Empress Catherine I, it was extended by architects Mikhail Zemtsov and Andrei Kvasov at the request of Empress Anna, before her daughter Empress Elizabeth finally turned to Rastrelli and asked him to demolish the building and replace it with a more grandiose and flamboyant Rococo structure. His new building dazzled courtiers and Ambassadors alike. 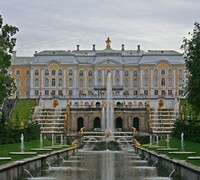 Located in Saint Petersburg and forming a series of palaces and gardens - sometimes referred to as the "Russian Versailles" - the Peterhof Palace was built by Peter the Great and later extended by Rastrelli, who added wings, and redesigned part of the gardens and fountains. The Smolny Convent of the Resurrection (Voskresensky), situated close to the River Neva, St Petersburg, consists of a Russian Orthodox cathedral surrounded by a complex of monastic buildings. Originally built for Elizabeth, the daughter of Peter the Great, who opted to become a nun after being refused the succession to the throne. As it happened, however, her successor Tsar Ivan VI was overthrown in 1741, and Elizabeth succeeded, although work on the convent continued at her behest. The convent's cathedral is regarded as one of Rastrelli's greatest works. 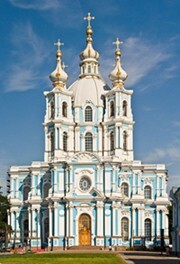 The cathedral's planned bell-tower would have made the cathedral the tallest building in Russia, but Elizabeth's death prevented its completion. It wasn't until 1835 that the building was finally completed. The nearby Smolny Institute, an important historical building, is named after the convent. The official Saint Petersburg residence of the Russian Tsars (1732-1917), the monumental green-and-white Winter Palace was designed by many different architects, most notably Rastrelli, who used a style known as "Russian" or "Elizabethan" Baroque. Shaped like an elongated rectangle, its main facade stretches for 250 metres. The building contains an estimated 1,500 rooms, 1,780 doors, 950 windows and 120 staircases. It later became a symbol of the 1917 Russian Revolution. See: German Baroque Art (c.1550-1750) and German Baroque Artists. See also: Italian Baroque Artists.  For more about "Russian Baroque" architecture, see: Homepage.